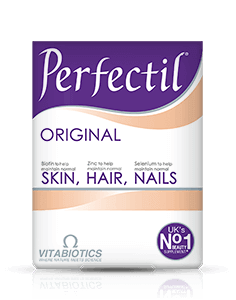 Perfectil Platinum Collagen Hair drink has been developed by the experts from Vitabiotics, the UK's No.1 vitamin company. 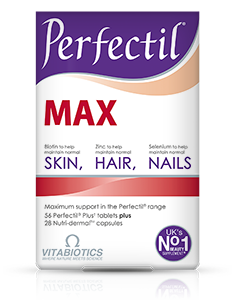 Perfectil is the UK's leading beauty supplement for skin, hair and nails. Our in-depth understanding of hair nutrition has enabled us to develop Perfectil Platinum Collagen Hair drink, taking the "science of beauty" to the next level. This great tasting liquid beauty supplement is specifically targeted to help support and nourish hair, providing a premium blend of 7000mg scientifically researched Peptan® Marine Collagen peptides, vitamins and minerals, amino acids, Inositol and Blackcurrant Seed Oil. Collagen is a protein that forms vital connective tissue, the elastic matrix that holds together the body's structures. In the skin, collagen is present in the lower layer, the dermis. This collagen matrix structurally anchors hair follicles in the dermis, which grow new strands of hair. Additionally, collagen helps to maintain the normal function of blood vessels (which deliver oxygen and other vital nutrients to the dermis and hair follicles). The amino acid, L-Methionine, found in the Perfectil Platinum Collagen Hair formula, is converted in the body into L-Cysteine, an amino acid which connects strands of collagen together through 'disulphide bridges'. These give the collagen matrix a strong structure, and are also found in keratin, the protein that makes up our hair. Perfectil Platinum Collagen Hair drink is formulated with 7000mg Peptan® Marine Collagen peptides. Peptan® is a world leading source of collagen peptides and is known globally as a highly effective and preferred bioactive ingredient. Numerous scientific studies have been conducted on Peptan®. Peptan's amino acid composition is high in hydroxyproline and glycine. In order to ensure maximum bioavailability, the Peptan® Marine Collagen peptides used in Perfectil Platinum Collagen Hair drink are low molecular weight when compared to certain collagen formulas available in the market. The phrase 'low molecular weight' means that each PEPTIDE is smaller and more easily absorbed by the body. 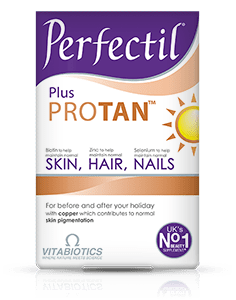 Perfectil Platinum Collagen Hair drink provides selenium and zinc which are known to help maintain normal hair health, plus copper which contributes to normal hair pigmentation. The formula also contains iron, a mineral that helps to maintain the normal formation of red blood cells, which are needed to carry oxygen to every cell in our body, including the cells of our hair follicles. The premium formula is also enriched with key supporting nutrients including Blackcurrant Seed Oil, Betacarotene, Inositol and L-Carnitine. 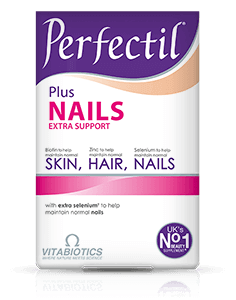 Perfectil Platinum Collagen Hair drink also includes specially selected nutrients to help maintain normal health of skin & nails for all round 'triple active' support. The formula contains selenium which helps to maintain normal nail health, plus biotin and zinc which help to maintain normal skin. Perfectil Platinum Collagen Hair drink has been formulated to be part of your daily beauty routine to help keep hair nourished from within. 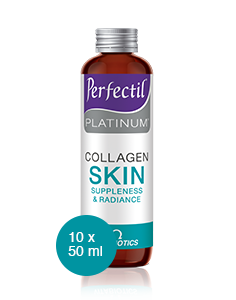 Perfectil Platinum Collagen Hair drink is available in the UK from Boots, pharmacies and health stores. Alternatively, you can order online here. Liquid food supplement with sucralose sweetener, marine collagen, vitamins, minerals and amino acids. Purified Water, Hydrolysed Marine Collagen (from Fish), Emulsifiers: Propylene Glycol & Glyceryl Stearate Citrate, Acidity Regulator: Citric Acid, Betacarotene, Preservative: Potassium Sorbate, Inositol, L-Carnitine Tartrate, L-Arginine Monohydrochloride, Thickener: Xanthan Gum, L-Methionine, L-Glutamine, Flavouring: Natural Orange Oil, Blackcurrant Seed Oil, Zinc Sulphate, Ferric Ammonium Citrate, Sweetener: Sucralose, Pantothenic Acid (Dexpanthenol), Copper Sulphate, Folic Acid (as Pteroylmonoglutamic Acid), Sodium Selenate, Biotin, Vitamin D3 (Cholecalciferol), Vitamin B12 (Cyanocobalamin). Allergy Advice: For allergens, see ingredients in bold. DRINK 1 BOTTLE (50ml) PER DAY. Take after your main meal. Shake well before use. Do not exceed the recommended intake. This product may be used for as long as required and a regular intake is recommended. Food supplements must not replace a varied and balanced diet and a healthy lifestyle. As with other food supplements, consult your doctor or pharmacist before using if you are under medical supervision, pregnant, breast-feeding, have epilepsy, haemochromatosis, suffer from food allergies, or are allergic to any of the ingredients. Not suitable for children. Allergy Advice: For allergens, see ingredients in bold on the ingredients list. Why has Perfectil Platinum Collagen Hair drink been developed? Who should use Perfectil Platinum Collagen Hair drink? Can Perfectil Platinum Collagen Hair drink be used during pregnancy and breast-feeding? How are the Perfectil Platinum Collagen drinks packaged? How and when should Perfectil Platinum Collagen Hair drink be used? 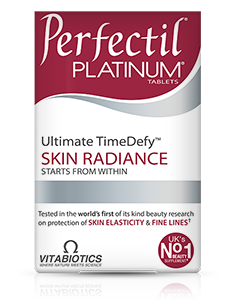 Are there any undesired effects whilst taking Perfectil Platinum Collagen Hair drink? Is Perfectil Platinum Collagen Hair drink suitable for vegetarians? Is Perfectil Platinum Collagen Hair drink suitable for those following a Halal or Kosher diet? How long does it take to experience any benefits in the condition of skin, hair and nails? Perfectil Platinum Collagen Hair drink, a great tasting liquid beauty supplement has been developed to nourish the hair from within. Always see pack before use for full information and directions. As with other supplements, seek professional advice before using if you are under medical supervision, pregnant, breast-feeding, suffer from food allergies, or are allergic to fish or fish products. This product contains iron, which if taken in excess, may be harmful to very young children. Vitamin supplements are not intended to treat or prevent any disease. Food supplements must not replace a varied and balanced diet and a healthy lifestyle.